blind men and elephant fish 맹인들과 코끼리 물고기: Academic freedom, blogging in Malawi, and other stuff. Academic freedom, blogging in Malawi, and other stuff. -Here is a great interview at the Nyasa Times with Boniface Dulani, a lecturer in Politics at the University of Malawi, about his blog and academic freedom in Malawi. He is rather eloquent. The academics at the University of Malawi have been on strike for quite awhile now over academic freedom of speech issues. -So Joy had malaria again. But she received excellent treatment from the all-Malawian doctors both at Chintheche hospital and at the Matiki Health Centre and is well on the road to recovery. A big thanks goes out to both organizations. The Illovo Sugar Plantation, on which the Matiki Health Centre is based, is a massive place. -Ranil over at Aid Thoughts gives a little more information on the possible causes of the fuel problems here in Malawi and other things. -And last but not least here is another picture of one of the beautiful little creatures we get to dive with everyday here on the lake. It is heartening to hear about the good service provided at Matiki Health Center. Today education and health care have become business enterprises and not act like social and service sector. This health center stands apart from others. 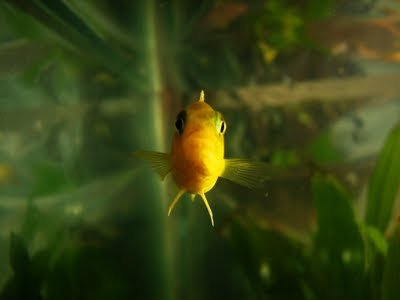 The Chimbenje, a foxy cichlid.